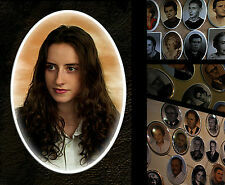 We make pictures on porcelain: color, black and white, brown sepia and colored (from black and white photos). Professionally - we have years of experience in the industry, we use the latest technology, we use only top quality materials. This funnel kit is designed to help you fill cremation jewelry and other small objects. It includes a small funnel and two toothpicks. for a HUGE selection of Cremation Jewelry. Model: B119511. Size: 25 16mm. Colour: Silver. They are designed to hold only a very small amount. Free velvet bag included. Brass Cremation Urn. Approx 4.5" Tall. Made in Thailand. I know the sadness and heartache of losing a loved one, and. Plated nickel with oak leaf motif. specific requests. Or you may request velvet bag instead. Color of case may be blue, black or red, my choice, but I will try to honor. 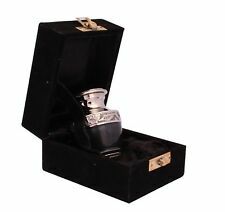 Lovely Solid Brass Satin Pewter w/ Black Keepsake Token Urn w/Velvet Bag~2 5/8"
Nickel plated finish with pink, embellished with a stylized rose. Display stand included. perfect for sharing a small portion of ashes with family or friends. Plate with screws on the bottom for filling. Pewter w/Gold Engraved Flora Dome Brass Keepsake Token Urn w/Velvet Bag~~2.5"
TOUGH AND DURABLE - The stake is manufactured from 3 mm thick solid aluminium and laser engraved on the front with your choice of text and graphics. It has a granite finish with polished brass banding. They are designed to hold only a very small amount. Free velvet bag included. This is a shade of turquoise or azure blue with lovely bronze banding. ~~SLIGHTLY IMPERFECT~~. They are designed to hold only a very small amount. Free velvet bag included. I am showing you examples of how it might look, but they might look much better. Size and style of heart. 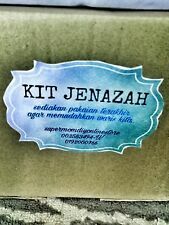 Heart is not included. Forward prongs can be stretched or squeezed to accommodate. This is a lovely satin finish solid brass urn with attractive banding, quite heavy for it's size. They are designed to hold only a very small amount. Free velvet bag included. Turquoise Flecked w/3-Ring Band SolidBrass Keepsake Token Urn w/VelvetBag~2 5/8"
They are designed to hold only a very small amount. Pink Banded Brass Keepsake Token Mini Urn w/Velvet Bag~~2 5/8"
They are designed to hold only a very small amount. Free velvet bag included. This is a pink color with lovely engraved bronze banding. 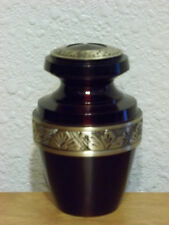 This is a beautiful small solid brass cremation urn. Urn has secure threaded screw-on lid. I know the comfort of having just the right urn for them. 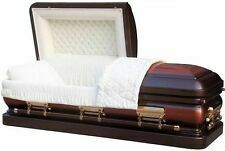 BEAUTIFUL TO CHERISH ~~ SUITABLE FOR BURIAL. The urn has a beautiful hand-painted finish. This urn has a top-opening with a secure threaded lid. Color & pattern may vary. This Urn Has A Top-Opening With A Secure Threaded Lid. 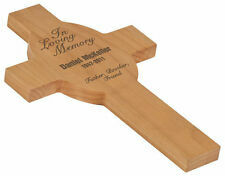 Holds Small Amount of Dried Flowers, Burial Soil, Locks of Hair & Cremains. Angel Wings Wrapped Around Aquamarine Stone Cremation Jewelry Urn and Necklace. This angel wings pendant opens to allow you to place a small amount of cremated remains inside. · A funnel kit for filling your jewelry. Round With Angel Pattern Cremation Jewelry Urn and Necklace. for a HUGE selection of Cremation Jewelry. · A funnel kit for filling your jewelry. This pendant opens to allow you to place a small amount of cremated remains inside. Open Heart Starfish On Beach Cremation Jewelry Urn and Necklace. for a HUGE selection of Cremation Jewelry. This pendant opens to allow you to place a small amount of cremated remains inside. It is hypoallergenic, comfortable and durable. They are designed to hold only a very small amount. Free velvet bag included. This is a beautiful finish like granite with multi-colored speckles and with lovely engraved bronze banding. Heart is pewter tone with gold paws, pewter tone display stand included. perfect for sharing a small portion of ashes with family or friends. Threaded screw-in plug on the bottom for filling. Any household funnel can be used for filling. I know the comfort of having just the right urn for them. which is equal to 2 - 3 lbs living weight. BEAUTIFUL TO CHERISH ~~ SUITABLE FOR BURIAL. I hope I am able to give you that small comfort. MPN UU800001A. 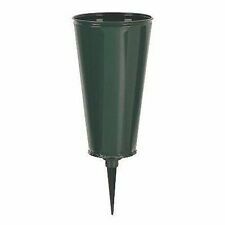 The ‘Peace Lilies’ Ashes Scattering Tube can be used to scatter ashes/cremated remains on land or water. Theses tubes are designed to simplify the scattering process featuring a perforated tab which can be pushed in prior to scattering. There may be a bit of finish paint on the gold doves. They are designed to hold only a very small amount. ~~SLIGHTLY IMPERFECT~~. Free velvet bag included. 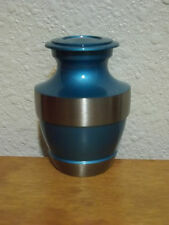 Smaller Solid Brass Urn~~Black w/Turquoise Flecks & Pewter~5"~for up to 26 lbs. 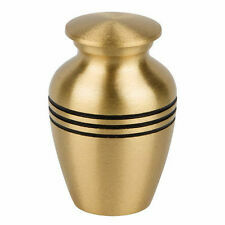 This is a very pretty smaller solid brass cremation urn, suitable for infant or child. Urn has secure threaded screw-on top. I know the comfort of having just the right urn for them. It is black w/turquoise flecks and pewter tone banding.